Melissa Adamo: Congratulations on your debut poetry collection! I was first intrigued by the title then hooked by the cover art (yeah, I judged the book by its cover). I was excited to follow footprints and blurred Sasquatch pictures when reading your heartfelt, engaging poems. Amy Pickworth: Thanks so much, Melissa! Isn’t it a great cover? I think I’m allowed to say that. The cover and interior of the book were designed by my friend Lucinda Hitchcock. She’s pretty wonderful. Adamo: Let’s talk birth of Bigfoot for Women. Did you set out with an intention to write a bunch of Bigfoot poems for a book, or did you see the thread in your work first? Pickworth: For a long while, I was thinking about Bigfoot, reading and watching Bigfoot stuff, taking notes. Then I wrote a couple of poems. It took a while before I thought it might be a book, but then the arc fell into place quickly. It felt and still feels a little like the book found me. Adamo: That makes sense since in no way did the book feel forced to me as a reader. What drew you to Orange Monkey? Pickworth: They were publishing a book by SMarie Clay, whose work I like, and I noticed that Matt Hart was judging their book contest. I also like his work as a poet and editor, and I realized that unlike so many deadlines, I hadn’t missed this one. I think I sent it on the last day of their submission period, or close to it. Mostly, I couldn’t resist sending a book about Bigfoot to a press named Orange Monkey. Orange Monkey is managed by Larry Eby. I soon learned he’s a nice guy and a thoughtful editor. Adamo: Can you talk a bit about your feelings before, after, during publication of your debut collection? Excited? Anxious? Did it send you running wild through the woods? Pickworth: The writing, the editing, and the period that followed was a solitary experience, and during that time I experienced a mixture of feelings that I think is familiar to most people who make things. The delighted This is great! Hahaha! followed by uncertainty and anxiety followed by a decision that you love it again—you really, really love it, until ugh, well, maybe you’re not so sure. It was merciful that this didn’t go on for long. I hadn’t sent the manuscript to many places before I learned it was going to be published, and that news was joy, was absolutely thrilling. I was giddy! Then the solitary work shifted, and it became collaborative. Larry and Lucy (I’m switching from saying Lucinda to Lucy—I call her Lucy in real life) and I quickly started thinking about how to create a print poetry book with a lot of links that’s reader-friendly. What does that look like? Can it be a print book, or does it need to be an e-book? Would QR codes work? For a while, the project focused on how we’d do it and on the design and production. Larry also suggested some minor edits. My father died while we were nearing the end of the design process, and that led to me making some additional edits. I took out a poem, revised a couple of others, changed the order slightly, wrote a new piece. I’m very grateful I had that time. The book feels whole and accurate to me now. And then yes: running wild through the woods is a good way to put it. You make this thing and get it on its feet, and you don’t know where it will end up. That’s lovely and very strange. It’s a little like being a mother. Adamo: I was excited by all the links, the various videos, and the websites I was able to visit during the course of reading the book. What was your (for lack of a better word) inspiration to include the links? And do you find this monster-hunt thrill is the case with most readers? Pickworth: Well into the project, I was struggling with this group of links I’d gathered. I wanted the images in them to be incorporated in the text vividly, in a way that wasn’t about simply describing them. When I mentioned this struggle to my friend Darcie Dennigan, she asked, “Why not include the links?” That was so helpful, so great. Things really opened up from there. Response to the book seems to be positive. There have been a couple of reviews—including your lovely one in The Rumpus—and I heard another’s coming out soon. It was taught in a couple of college classes earlier this year. I’ve gotten a couple of nice notes from strangers. And that’s incredibly gratifying, making something some people connect with. It’s been interesting hearing how readers choose to interact with the book. Some seem to enjoy spending a lot of time with the links, while others choose to read the text only. It seems to work both ways. At least I hope so. Adamo: I certainly think the book works in both ways, which seems to be no easy feat. What’s the best advice you received about putting together a first poetry collection? 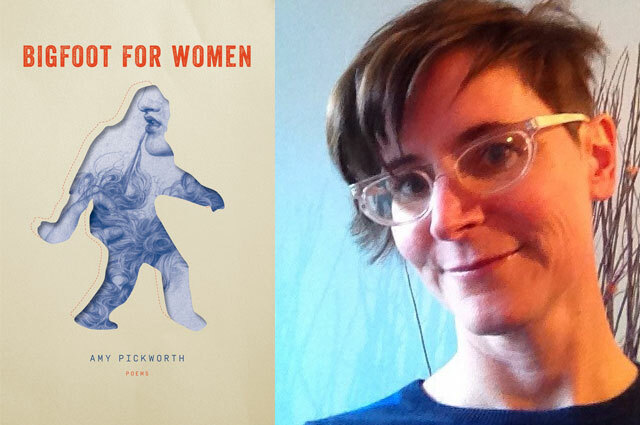 Pickworth: Maybe the advice to not write a book of poems about Bigfoot. It became something to push back against. Adamo: What’s your favorite Bigfoot story and why? Pickworth: Probably the one about Kale Peary and his father, Admiral Peary, and the letter to Admiral Peary from his wife. Those stories and people really got in there. They broke my heart, all of them. Adamo: What are you currently working on now? Can we expect a new Nessie book? Pickworth: I do love Nessie, but all signs point to no. Something else. It’s too early to talk about just yet because it’s only starting to come together, but I’ll be happy to let you know when it’s out there running in the wild, or nearly ready to be. Adamo: Can’t wait! Thank you so much for speaking with us! Amy Pickworth’s Bigfoot for Women is available from Orange Monkey Publishing.